Happy holidays! And welcome to the Winter 2016–2017 issue of The Objective Standard. 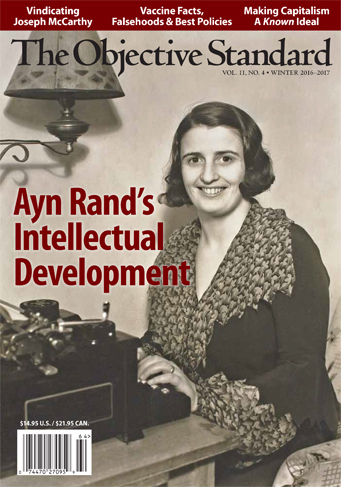 First up is “Ayn Rand’s Intellectual Development” by Michael S. Berliner. This essay surveys the choices, values, and events that shaped Rand’s intellectual and professional life, from her early childhood years and preteen writing and thinking in czarist Russia; to her university and postgraduate years in Russia following the Revolution; to her life and work on plays, fiction, and nonfiction in Chicago, Hollywood, and New York City. Dr. Berliner, the founding executive director of the Ayn Rand Institute and senior adviser to the Ayn Rand Archives, brings great depth and breadth of knowledge to this subject. The result is a biographical portrait of Ayn Rand like no other. Next up is “The Vindication of Joseph McCarthy” by Andrew Bernstein, which examines the myths and facts surrounding this controversial figure and his efforts to expose communist infiltration into the U.S. government in the 1950s. Marshaling substantial evidence that has become available during the past few decades, Dr. Bernstein shows McCarthy to be not a villain but a hero. This act of justice has been a long time coming, and Bernstein delivers it with his usual flair. In “Vaccine Facts, Falsehoods, and Best Policies,” Ross England and Joe England (medical doctors, both) offer an essentialized discussion of the science surrounding this controversial subject, as well as a prescription regarding the thorny question of whether vaccines should be mandatory for students attending government-run schools. Wherever you stand on this controversial issue, I think you’ll find this essay edifying. In “The Greeks and America’s Founding Fathers, Part 2: Learning What Not to Do,” Timothy Sandefur takes us down another stretch of this fascinating road, focusing here on ways in which the Founders learned from the Greeks’ mistakes and sought to avoid them in constructing the land of liberty. Next, in my interview with C. Bradley Thompson on “Making Capitalism a Known Ideal,” Dr. Thompson discusses the mission and programs of the Clemson Institute for the Study of Capitalism, including its new Lyceum Scholars Program, which is inspired by and named after Aristotle’s school, The Lyceum. If you’re interested in spreading capitalism, I think you’ll find this interview heartening and inspiring. The Clemson Institute is doing this right. Books reviewed in this issue include Judicial Review in an Objective Legal System by Tara Smith (reviewed by Michael J. Mazzone); A Man on the Moon: The Voyages of the Apollo Astronauts by Andrew Chaikin; and Which One Doesn’t Belong? A Shapes Book and Teacher’s Guide by Christopher Danielson (both reviewed by Daniel Wahl). Finally, our section From TOS Blog includes “America’s Next Leftist President: Donald Trump”; “Government Crushes For-Profit Colleges, Jobs, Students’ Dreams”; “Bad Parenting, Bad Education, and the State of America” (all three by me); and “‘How to Talk to Anyone about Energy’: Alex Epstein’s Principles of Persuasion” by David Biederman. If you’ve not yet done so, be sure to join us on Facebook and Twitter for a steady stream of interesting links and engaging conversation. And, with Christmas and Hanukkah around the corner, consider giving gift subscriptions of The Objective Standard to your friends and family. As our advertisement says, your holiday shopping could be done in minutes, and it could enlighten your loved ones for life. Simply visit our website and click on “Give a Gift” in the menu bar. I hope you enjoy the issue and your holidays. Here’s to a productive and prosperous 2017!